The Baobob tree on menu hints to Central Harlem's Yatenga French Bistros' country of inspiration but the menu gives a further clue to its French connections. Yatenga is the northern region of Burkina Faso, a small country in West Africa that has many French influences. The owners of Yatenga French Bistro and Bar brings on the European charms of a classic bistro mixed with rustic aesthetics that blend seamlessly together. 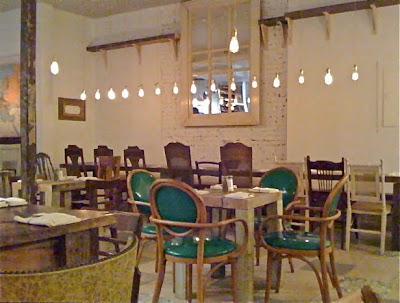 A painted white brick interior with crackled painted ceilings, mid century diner stools, eclectic antique chairs, industrial lights, filament light bulbs, unfinished lumber benches and tables greet guest upon entering the eatery off of ACP/7th Avenue. 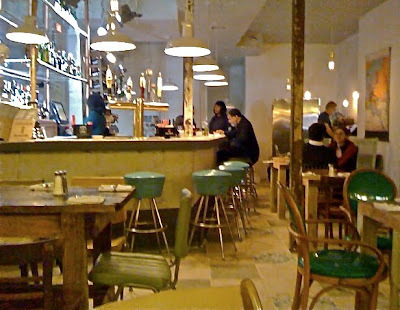 Just on looks only, Yatenga easily carries a European casualness that one can not really find outside of downtown areas such as Soho. On the food front, Yatenga has some hits but at the same time, restaurant is working issues out with the menu. The prix Fixe menu starts at $22 for four courses and the winning dishes are definitely the land based items. The salads that comes with the four courses are amazingly fresh and full of robust flavors. 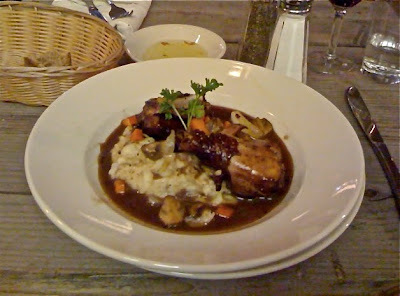 Bistro standards such as escargot are tender as they should be and the Coq au Vin is one of the best ones in town (second from last photo). The only misstep here was a pastry wrapped salmon dish that was rather dense but lacking in flavor somehow. What's that old adage about ordering seafood on the weekends? 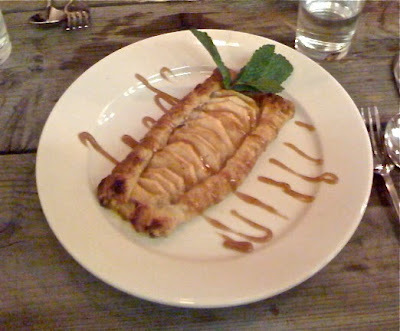 Lastly, the apple tart (last photo) at the end was sublime and obviously freshly prepared. All that said, Yatenga is a must to visit for anyone in Harlem. 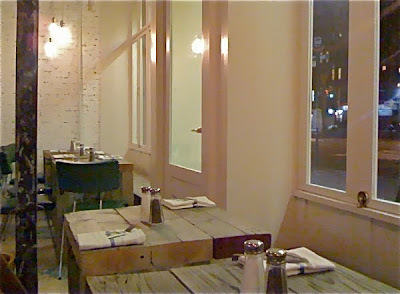 Check it out and help out the growth of Harlem's new boutique restaurants. 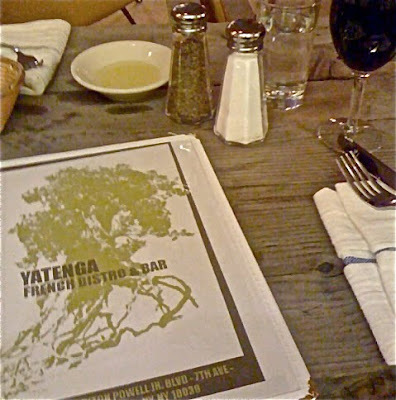 Yatenga French Bistro is on 2269 Adam Clayton Powell Boulevard (7th Avenue), just below 134th Street. Tel.212.690.0699. The nearest trains are the B or the 2,3 express at 135th Street. Photos by Ulysses.